Blustery November storms brought enough snow to [R493R, Whistler Blackcomb] that the resort is opting to open Whistler Mountain six days early for skiing and riding. Dreams of another La Niña year pervade Whistler, where forecasters predict a repeat of last year when Whistler Mountain opened early and amassed the second snowiest winter on record. The lifts on Whistler Mountain will begin loading Friday, Nov. 18. Skiers and riders will be able to access three mid-mountain lifts—the Emerald Express, Big Red Express and Franz's Chair. The resort cautions that beginner terrain will not be available yet, just intermediate and advanced slopes. Uploading will be via the Creekside and Whistler Village gondolas. The gondolas will load the first cars at 8:30 a.m. But the line up for first car will start much earlier. Typically at Whistler, skiers and riders begin lining up the night before opening day. If you wait until 6 a.m. to show up, you may be at the back of the crowd. A sunny day at the summit of Whistler Mountain Tuesday is expected to give way Wednesday to an incoming storm that may deliver powder for opening day. 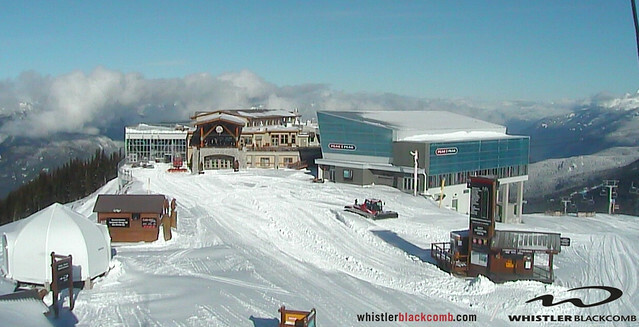 Photo Courtesy of Whistler Blackcomb webcam. Weather predictions for Whistler Mountain's opening day bring good news and dreams of powder. A large storm is expected to roll in Wednesday and Thursday, just in time to drop temperatures for snow. Opening day should see lingering snow showers and brisk cold temperatures. Whistler Mountain will operate daily from here on, adding more lifts and more terrain as conditions permit. The resort plans to open Blackcomb Mountain on Nov. 24, as planned. To add to the opening day hype, pro freeskier Mike Douglas is currently camped out at the top of Whistler Mountain. With his computer and camera, he plans to document six days beginning the season. You can watch his videos filed each day this week here.